Overcapacity reigns as companies splurge on the largest ships, consolidation rages, no one wants to back off. In August 2016, Hanjin Shipping Co., at the time the world’s seventh largest container carrier, sought bankruptcy protection. It was the largest bankruptcy in shipping industry history. On February 2, 2017, the Seoul Bankruptcy Court declared that Hanjin Shipping would be liquidated, as restructuring its debts would be “prohibitively expensive.” But just how big was this debt load? Hanjin Shipping had originally admitted to the equivalent of $5 billion in debts. Once the bankruptcy court got to work, there were nearly weekly announcements that more debt had been found, tucked away in nooks and crannies of the once glistening edifice. In the end, it was determined that Hanjin, when it entered receivership, actually had $10.5 billion in debts. Hanjin had been tripped up by, among other factors, a problem that plagues the container shipping industry: overcapacity. And despite Hanjin’s liquidation, that overcapacity is getting a whole lot worse. Zimm Integrated Shipping Services (Israel) increased its capacity by 24.5%. Orient Overseas Container Line (Hong Kong) added 18.4%. COSCO, a state-owned product of China’s “command economy,” added 12.4%. Maersk Line, the largest carrier by capacity, ahead of COSCO, added 10.8% in capacity. ONE (Ocean Network Express), a brand-new company formed from the container divisions of Japan’s top three shipping companies (Mitsui-O.S.K., Nippon Yusen Kaisha and K-Line) added 7.9%, despite many promises to the contrary. Including HMM, the average capacity increase for these 13 already huge shipping companies was 8.5%. Including all companies, big and small, container carrying capacity worldwide increased by a 9.3% year on year. Note that just like the Baltic Dry Index, the CCFI is not a measure of trade volume, but a measure of how expensive (or cheap) it is to ship goods by sea around the world. Only part of the collapse of the containerized freight rates in 2015 and 2016 was due to overcapacity. Another major factor was the plunge of the price of oil, and therefore of bunker, the fuel for these giant container ships. With the CCFI well below 1,000 since 2015, while bunker prices have been rising since 2016 along with the costs of emission compliance, profits are being eroded, and momentous changes are sweeping through the industry. Above mentioned ONE can be considered one of the poster children for this “brave new world”: it started operations on April 1, 2018 (the beginning of the fiscal year in Japan), and during its first quarter of existence has already managed to lose $120 million. Japanese shipping companies have a time-honored tradition of ignoring losses until they become too large to be ignored, and then there’s always a big scandal followed by an emergency bailout, merger or takeover. So a measly $120 million in losses in a single quarter is of no concern to them. AP Moller-Maersk, the parent company of Maersk Line, bought Hamburg Süd from Dr Oetker KG of Germany for €4.3 billion. In 2013 Hamburg Süd had attempted a merger with Germany’s other shipping giant, Hapag-Lloyd, but Dr Oetker KG pulled out when a satisfactory financial package could not be agreed upon. Hapag-Lloyd then merged with perpetually troubled Gulf carrier United Arab Shipping Company (UASC), resulting in a curious ownership situation. Due to previous mergers and share swaps, the largest shareholder of the “new” Hapag-Lloyd is Chile’s Grupo Luksic (20.7%), followed by three that each own 14%: Kuehne + Nagel AG (Germany, run through a shell company in Switzerland); the City of Hamburg; and Qatar’s national wealth fund, QIA. Saudi Arabia’s Public Investment Fund owns 10%. The rest is free float. 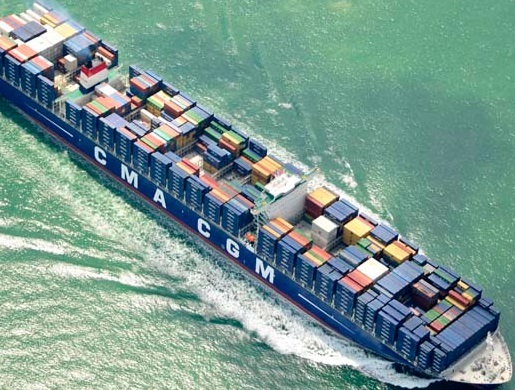 This group of shareholders has recently started looking for a further merger, but recent negotiations with CMA-CGM broke off due to anti-trust concerns. Everyone has been keeping an eye on COSCO. It announced last year to great fanfare the purchase of Orient Overseas (International) Limited (OOIL) of Hong Kong for the equivalent of US $6.3 billion. OOIL has long been one of the most profitable shipping companies worldwide. The fact that it is majority-owned by the Tung family, one of Hong Kong’s most powerful and richest clans, surely doesn’t hurt. OOIL’s container division, Orient Overseas Container Line (OOCL), ranked as the seventh largest container carrier by capacity when COSCO put forward its offer. Stock markets uncorked the champagne and the financial media went into the usual hyperbole to sell yet another “deal of the century.” As the purchase process made its way through anti-trust agencies around the world, it seemed like a done deal until April 2018, when it run into two snags. The first snag is the Trump Administration. In 2011, OOCL struck a deal with the Port of Long Beach to finance a large-scale modernization and expansion of the Long Beach Container Terminal (LBCT) in return for majority ownership. At the time, OOCL was owned by a wealthy Hong Kong family, so nobody raised any objections. Now things have changed: The Trump Administration has tasked the Committee on Foreign Investments (CFIUS), a panel of experts from 17 government agencies, with deciding if the LBCT constitutes a “strategic asset” and, if so, if it can be owned by a company directly controlled by a foreign government locked in a trade war with the US. COSCO has already extended an olive branch, offering to sell the LBCT after the merger “at cost” if a buyer can be found. But until the CFIUS issues a ruling, the situation has stalled. The second snag is the Chinese government itself. Despite being a state-owned enterprise, COSCO had to seek approval for the OOIL purchase from the Anti-Monopoly Bureau in Beijing. Initially it seemed little more than a formality, but deadline after deadline has passed without the Bureau issuing a ruling. Neither COSCO nor the Chinese government have provided any explanation even after the last deadline, June 30, 2018, came and went. We’re left in the dark as to the motives, but China’s highly complicated power structure and the even more complicated relationships between Hong Kong and Macau “godfathers” and the Mainland government most likely have a hand in it. By MC01, a frequent commenter on WOLF STREET. Can I assume that just because Hanjin’s assets were liquidated the ships weren’t actually sunk. I assume those ships are now owned by someone and at a fraction of the cost of new. I wonder if it’s possible that if Hanjin managed to hide double it’s debt, that was only discovered by a bankruptcy court, there many more out there more zombie than solvent. David, the liquidators appointed by the Seoul court have been having a very hard time selling Hanjin Shipping assets. Five ships, two container terminals and a few of the North American routes were sold to Samra Midas (SM) Shipping, a new shipping company formed by the Samra Midas chaebol in Korea to pick up some of the slack left by Hanjin Shipping, but the rest of the assets are taking a long time to sell, meaning they go for pennies to the dollar. Last time I checked in May 2018 the liquidators had obtained about US $300 million from the sale of various assets (including those above), a pittance compared to the US $10.5 billion owed by Hanjin Shipping. Creditors will have to eat a lot of losses, whether they like it or not. Regarding zombies… it’s a very sensitive area because so many large shipping companies are based in jurisdictions that allow private companies a lot of leeway on the information they choose to release or to withold. The Korean government, very much like other governments across Asia, has a time-honored tradition of looking the other way and sometimes very slack oversight, but also remembers what happened in 1997. Hanjin Shipping took the books to court hot on the heels of the Daewoo accounting scandal, the largest corporate scandal in Korean history. After almost two decades of promising the financial excesses which led to the 1997 Asian Crisis “would never happen again” here were two big chaebol companies doing exactly that, but on an even larger scale. It’s my personal opinion both the wave of jail sentences which decimated the Daewoo leadership and the Hanjin Shipping liquidation are the direct results of the Korean government entering damage control mode. COSCO adding lots of shipping capacity just in time with a trade war with the US. Is there a ‘capacity usage rate’ issued by firms/industry – such as a real estate vacancy rate? Cost of loads such as Asian shipped cars ships vs US recycle materials for return trips are interesting figures. Great piece !. It could help to reclassify those soybeans as hot potatoes. Truth is just so plastic these days. Not to worry. Those hot potatoes are plastic. (Putting a practical spin on overshoot and dodgy business practices). Surplus C-Cans make absolutely great job-site tool cribs and small home shops. Get the inside sprayed with foam insulation to stop any condensation problems, throw up some shelves and necessary electrical service and Bob’s your uncle. You can dress up the outsides, or cut extra windows in for a better neighbourhood look. In some cities they make small apartments out of them for homeless. For someone short of time, or lacking building skills, this over supply/collapse is just one more opportunity. The so-called Global Economy is really just a collection of racketeering operations, variously abetted by national governments according to need, greed, convenience, and quality of campaign contributions. The mythical Invisible Hand is supposed to resolve these sorts of problems, but instead it just gives us the finger. The coming collapse of the containerized shipping industry is expected to be too small to cause another global financial crisis. Worldwide financial distortions are all hedged in the derivatives markets and a few billion here and there just gets lost in the noise. Well you are probably mostly right. And as Wolfe never tires of saying: “It works until it doesn’t”. I do believe, though, that if there is a “collapse” of the containerized shipping industry it will be because we have much more serious problems. All run by the Macau Godfathers. Yes, they are everywhere. Unamused, you worded it Perfectly!! That photo of the container ship doesn’t look right. The containers have the wrong shape, thin like dominos. Is it lego? Each 40-foot container, as those loaded on the ship in the photo, is 8 feet 6 inches wide (that’s 2.6 meters wide). That’s exactly what you’re seeing in the photo. I think the picture is a camouflage job done by CMG lines to get people(competitors) to believe they are carrying a full load of boxes if viewed from another vessel or shore. The inside areas of the hatches are empyty but the outboards are fully stacked, giving the illusion of a fully laden vessel. Re: the take-no-prisoners expansion of the iron ore ships, a parallel exists in Oz iron ore extraction. Even Fortescue, itself a big player, has joined smaller miners in protesting to the Oz govt about the relentless expanding capacity of super majors BHP and Rio Tinto. For their part the latter say if they can make a profit a 45 a ton and the smaller guys can’t, too bad. So the moral of the story is don’t try to compete with Chinese State owned corporations. What are these vertical blue things that look like drawers on the side of the CMA-CGM ship: barriers of some sort? I see. I was confused by their uniformity but they’re the house brand, so to speak, so it makes sense. Thanks! I assume that the shipping industry, like the home construction business, has a cycle of several years. It takes time to design finance, and build these monsters, a few years probably. If this is started anywhere near the middle of a business cycle, the ships will be launched just in time to be right in the middle of a downturn in the market. To be successful, a shipyard has to have a fully-functioning crystal ball. Reminds me of back in my Realtor days in the Eighties. Things were going fine. Builders bought raw land, got it through subdivision and all the permits and regulations, and started building. By the time they had a model home up the market had died. It takes 2-3 years. Unfortunately the business is filled with incompetent top management. Lots of nepotism and a real mess in general. What mechanism do they use to lock the containers together? The physical forces must be considerable to bind a stack of 8-10 containers in high seas. And, the photo of the Majestic Maersk (in the gizmodo article) confirms my impression from the ship photo that accompanies MC01’s post: these are very long, narrow (Cf. vessel length: vessel width) ships with short, stubby prows. Steering these vessels must be a nightmare? “Tugboats” must come into play when they enter and leave ports ??? MC01, you have described some broken vessels in earlier posts/commentary, and it does seem as if some types of rough seas would put tremendous stress on these big, long ships. It will be interesting to see how the next generation, of bigger longer? ships, holds up in rough seas. Tugboat usage at ports is at a minimum, since bow thrusters are in use on most of these vessels. The short stubby prow you see is actually the “Bulbous bow” designed to cut down the bow wave generated by going through the water and increases speed. There are no problems steering these vessels as their rudders are huge. Hull stresses are large but are handled by a huge box girder built into the top outboard corners of the hull with high yield strength steel. It depends on the ship’s design. Some have cell guides look at http://www.aclcargo.com for ship schemtaics. I have seen this everyday from inside the industry for over 30 years. You simply would not believe what goes on. Wolf makes some excellent points. The industry is boom and bust. Read “The Box” by Marc Levinson. There will be more bloodletting to come. Stay tuned. I am sorry for not clarifying and replying to this thread but I had unexpected business to deal with which required my total attention. A thank you to everyone and to Mr Richter for his editing work.